Summer is in full swing. For many of us, that means trips to the pool or the beach to cool off from the summer sun. So what are the options for people — women in particular — whose religion dictates modest dress? Deciding what to wear in the water as a conservative or plain clothes dresser varies by religion, and among individuals within a faith. Here are some of the general rules and practices of some major faiths. The Church of Jesus Christ of Latter-Day Saints provides guidelines regarding swimwear in an official document, "Handbook 2: Administering the Church," available on the church website. According to the Utah-based faith, adult Mormons are required to wear special garments, a type of underwear that covers the shoulders and upper thigh, once they participate in sacred ordinances in an LDS temple. However, Section 21.1.42 of "Handbook 2" states that the garments may be removed for swimming. Nevertheless, Mormon women are encouraged to buy swimsuits that uphold the church's general standard of modesty. While this does not mean their suits have to cover as much as the garments would, they generally are expected to cover midriffs and to wear bottoms with sufficient coverage. This allows Mormon women, if they so choose, to wear fairly modern one-piece suits and tankinis. Some unofficial LDS sites, such as LDS Living, publish swimwear guides to help girls find fashionable, modest suits. Regulations for nuns' swimwear are far from universal. According to Sister Lorraine from Ask a Catholic Nun, a social media-based forum run by the Daughters of St. Paul, some cloistered nuns never swim at all, while those of other orders may choose to wear fairly modern suits. Although popular culture typically depicts nuns wearing traditional, veiled habits in their day-to-day lives, many no longer do so. As a blog post on the website of A Nun's Life Ministry explains, a "habit" is technically a "clothing characteristic of a group." In this case, their habit is general modesty to discourage their bodies' being seen as sexual objects. "We would dress in a way that would create a climate favorable to chastity," Sister Lorraine wrote. "What that would entail in a particular case would be up to the good judgment of each sister." Burkinis, full-coverage bathing suits, made headlines last summer (and again recently) when they were banned from some beaches in France. 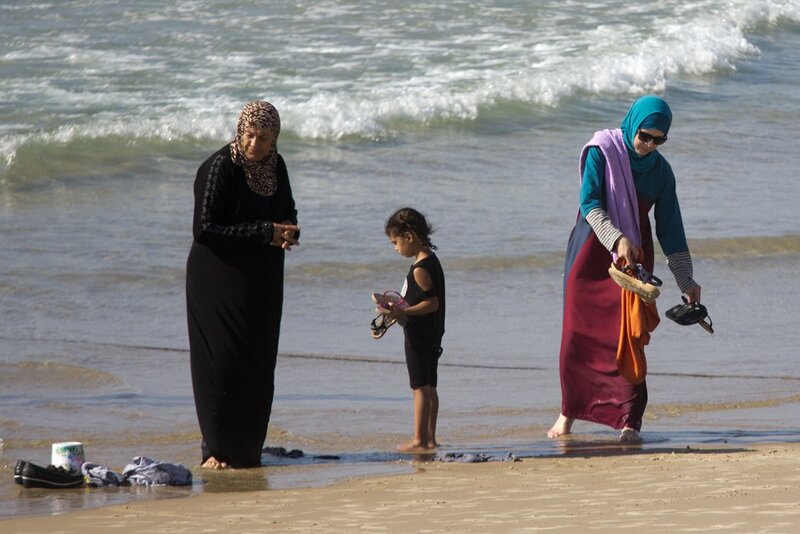 This type of suit, however, is an option for Muslim women who want to swim in public while maintaining their standards of dress, short of swimming fully clothed (including veil). 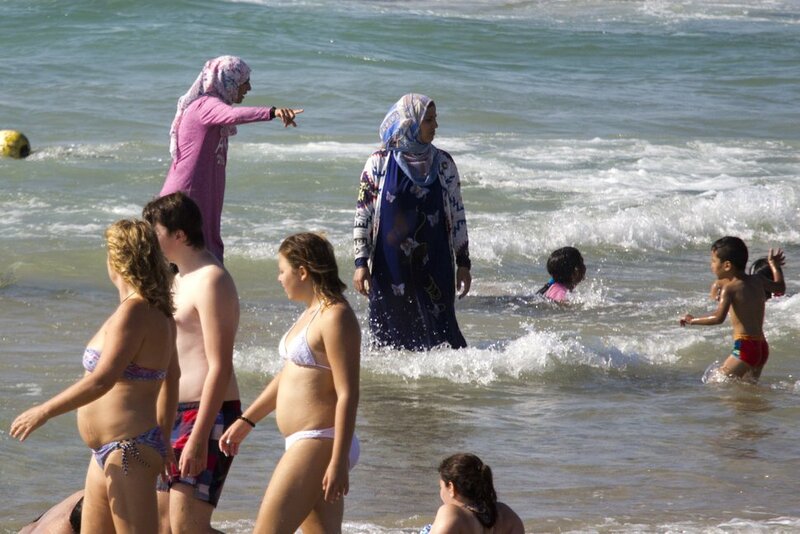 Leaving only the face, hands and feet uncovered, the burkini doesn't provide as much coverage as the many types of head coverings that Muslim women generally wear after puberty. But it conceals the hair in the same way a hijab, or headscarf, would. Burkinis may be some of the most conservative bathing suits, but that doesn't mean they can't look trendy. Shops such as Adabkini offer burkinis and semicovered suits in a variety of colors and styles. Mahei Fatourade started the swimwear store Adabkini in 2014 after noticing fashion-forward burkinis in Turkey. He saw the demand right away, as his sales went up by 300 percent in the first year. "Still, it's growing," he said. "There's a huge market." While not all Mennonites avoid modern inventions as the Amish do, members of both these Anabaptist Christian groups are typically expected to partake in "plain dress," which for women includes wearing long, basic dresses and head coverings for modesty. According to Steven Nolt, a professor of Anabaptist studies at Elizabethtown College in Pennsylvania, most of these groups "discourage or completely prohibit mixed-gender swimming." For this reason, they will often swim in more secluded places as opposed to public beaches. Lucinda Miller, a member of a conservative Mennonite group in Wisconsin, explained that it doesn't matter what she wears in a women-only group. "People might wear a suit and some people might wear shorts and tops or whatever," she said. "There's quite a bit of variety." Also, Nolt said, young children are able to wear more modern swimwear, as they are not yet official members of the church. Older Amish teenagers have more freedom in what they wear too, during the period of rumspringa. Depending on the region and the specific group, Nolt said, families will sometimes go to the beach but not necessarily swim. In this case, he's seen women wear their full-length dresses and men wear short-sleeved, button-down shirts. While some Orthodox movements such as the Hasidim are more conservative than others, Jewish law, or halakhah, generally requires a female's collarbones, elbows and knees to be covered. A swimwear company catering to these needs, Aqua Modesta, was founded over a decade ago by designer Regine Monavar Omid Tessone, to make halachic bathing suits out of breathable material that dried quickly, like a regular bathing suit. Her company sells swim dresses and swim sets ranging from a girls size 6 to a women's size 20. "The idea of the line is to create more modesty," she said. "Once this modest swimwear came out, there was no more excuse [to wear revealing suits]."